I purchased a bunch of hair care products from Juicy chemistry a few months back and I almost emptied most of the product and just realized I haven’t shared review with you guys. Juicy chemistry Lavender and sage hair oil has greats reviews on many blogs and since I love lavender, I bought this. I wasn’t expecting this to reduce hair fall since hair oil cannot reduce hair fall. I had high hopes since it is meant to deep condition the hair. Let’s see whether the oil fulfilled its claims or not. Looking for a one-stop solution for all your hair problems? This sweet-scented hair oil brings together a bouquet of essential oils such as lavender, sage, cedarwood, bergamot, peppermint, and rosemary mixed into a base of castor oil, cold-pressed almond oil, olive oil, coconut oil, and Vitamin E. Into this goes a pinch of dried herbs such as rosemary, lavender, mint, and sage. Use this magical elixir on your tresses and watch it undergo a Rapunzel-like transformation! Olea Europaea (olive) oil*,Simmondsia Chinensis(Jojoba )Oil*, Prunus Armeniaca (Apricot) Kernel Oil*,Cocos Nucifera (Coconut)Oil*,Prunus Dulcis (Sweet Almond) Oil*,Lavandula angustifolia (Lavender) OIL*,Rosmarinus Officinalis (Rosemary) Oil*,Ricinus Communis (Castor) Seed Oil*,Mentha Piperita (Peppermint) Oil*,Cedrus Atlantica (Cedarwood) Oil*,Citrus Bergamia (Bergamot) Oil*,TocopherolSalvia Sclarea (Clary Sage) Oil*,Salvia Officinalis(Sage) OIL*,Lavandula Angustifolia ( Lavender )Flower*,Rosa Damascena ( Rose ) Flower*,Salvia Officinalis ( Sage ) Leaf*,Mentha Piperita (Peppermint) leaf*. 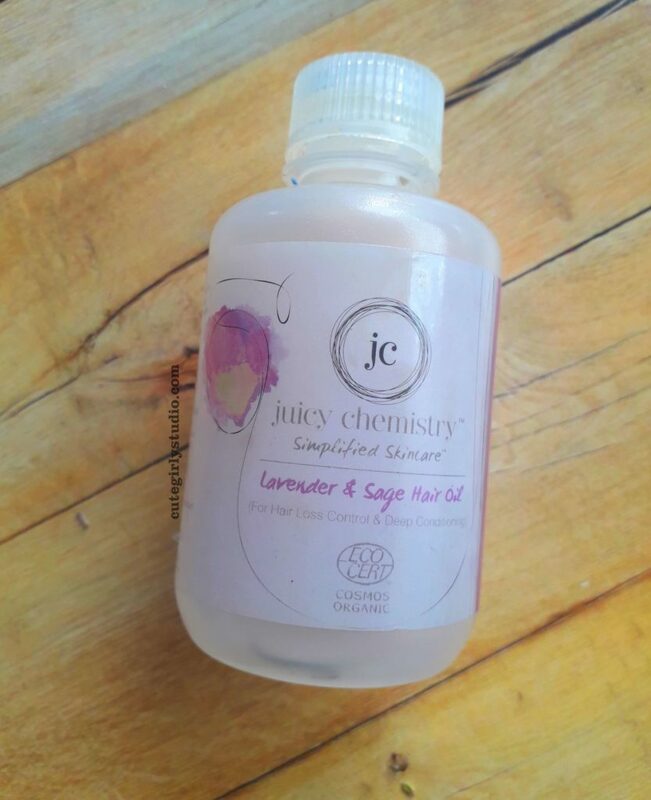 The Juicy chemistry hair oil comes in a small plastic bottle. The packaging is not travel friendly since the oil tends to spill around. The juicy chemistry lavender and sage hair oil is pretty light weight and not heavy. It has a strong smell which is a mix of minty with a citrus note. The smell is strong that even after even after washing my hair, the smell lingers. If you are someone with a sensitive nose then I don’t think you will enjoy using this oil. The strong smell doesn’t bother me since I like the citrusy smell. I usually warm my oils before application. I always warm Juicy chemistry Lavender and sage hair oil in double boiler and apply it all over my scalp and hair. Leave the oil overnight and wash it off the next morning. I oiled my hair twice a week regularly and I don’t find that it reduces hair fall. I expected this to deep condition my hair, but it didn’t. If you have straight hair, it will condition your hair. If you have wavy or curly hair, this hair oil is not that conditioning. I feel relaxed whenever I use Juicy chemistry Lavender and sage hair oil to oil my hair due to the essential oils present in the concoction. This hair oil will be better pick for hot oil treatment after a long tiring day. Overall I find this to be decent hair oil which hydrated your hair decently. No. There are many better options available at the fraction of cost. If you love using oils with citrus or minty essential oils then you can give this a try. Hope you like the review. Thanks for stopping by.